Would that John Bolton were only a clown. The mustachioed alleged diplomat, briefly of the Bush administration—and initially criticized as too controversial even for that team—has now been appointed national security advisor. That position will give him the president’s ear on matters of foreign policy, as well as control over which other administration principals enjoy such access. Donald Trump pledged that if elected he would be a different kind of Republican president, and he’s delivered: under the last GOP administration, Bolton occupied a slightly lower-ranking position than he does now. Bolton is indeed no circus act: he’s one of the sharpest and most dangerous national security operatives in Washington. To take just one example, last summer, Trump made it known that he was considering pulling out of the Iran nuclear deal, a campaign promise he wanted fulfilled but that had been discouraged by his then-secretary of state Rex Tillerson. Sensing an opportunity, Bolton wrote an essay for National Review explaining in breezy (i.e. Trump-digestible) terms just how to abrogate the agreement. The piece is chockablock with nonsense: at one point it claims sans any evidence that the Obama administration believed the JCPOA was “disadvantageous to the United States.” It also offers scant evidence to underpin its claim that Iran was in violation of the deal, an assertion that’s been repeatedly repudiated by the authorities at the IAEA. But the truth wasn’t the point: the piece was meant to water a seed in the president’s mind, to lend expert opinion to Trump’s burning preference that the JCPOA be reversed. That Bolton did this shouldn’t surprise anyone because this is how Bolton works: shrewdly and always towards the goal of more war. 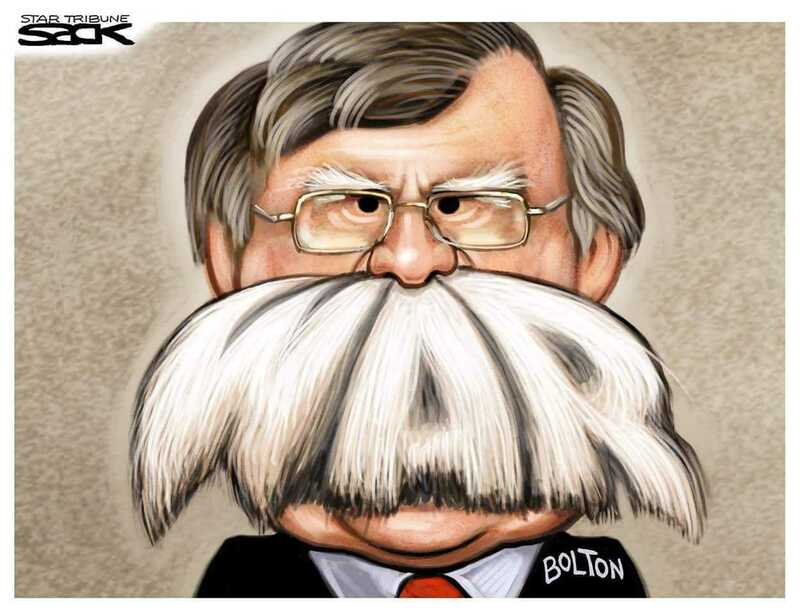 As Gareth Porter detailed in a rigorously reported piece for TAC, during his tenure under Bush, Bolton maneuvered behind the scenes to pump up a pretext for conflict between the United States and Iran. Among his methods was to pretend that satellite images of a military base at Parchin demonstrated Iranian nuclear experimentation. That supposed smoking gun is cited to this day by neocons as proof of Iran’s atomic dreams. On Libya, in 2011 before the Obama administration launched its calamitous intervention, Bolton recommended that the United States assassinate Moammar Gaddafi. On North Korea, he innocently suggested there was a “legal case” for a first strike. On Russia, you will not be surprised to learn that he thinks Trump needs to get tougher, including launching a cyber-attack that would be “decidedly disproportionate” to anything the Russians have done. He also thinks it’s time to revisit the “One-China Policy” that prevents us from antagonizing Beijing by recognizing an independent Taiwan. There are all manner of vexatious wrinkles amidst those pronouncements. For instance, a foreign policy realist might note that the deposal of Iraq’s regime and the ascendance of Shiite power in Baghdad, which Bolton supported, greatly availed Iran, which Bolton detests. But again, such nuances are dwarfed by the big-picture concepts in which Bolton deals, like American Power and Dictatorships and Strength. Most foreign policy gurus, despite supporting generally hawkish policies, have at least disowned the war in Iraq and made some perfunctory efforts to adjust for its failures. Not Bolton, who is that most ludicrous of creatures: the unreconstructed Bush-era thinker. He belongs behind a glass display in the American History Museum, not enjoying a second wind at the apex of the federal bureaucracy. But alas, the president himself has spoken. There are conditions to Bolton’s employment. CNN is reporting that Bolton promised Trump—quote — “he wouldn’t start any wars” if he became national security advisor, and surely that’s a promise he’ll keep. Bolton, after all, has never started (or fought in) a war in his life. What he will do is counsel Trump to take the most belligerent course of action possible in every given situation. Up first will be the Iran deal, which, with Bolton now at NSC and Mike Pompeo at State, seems certain to be the subject of a hardened stance from the White House, which will further isolate America from its allies, as the Europeans, more commercially entangled with Tehran than we are, decline to go along. That brings us back to Trump, the insurgent who won the 2016 election pledging to repudiate the George W. Bush legacy and keep the United States out of foreign wars. It’s a show of both neocon strength and Trump impressionability that a mere year and a half later the most warmongering personality in Washington has already clambered all the way up to national security advisor. I’m new here at TAC, but I’m quickly learning that part of the arrangement is that we lose 100 battles for every one we win. Matt Purple is managing editor of The American Conservative. Bolton’s often inflammatory rhetoric is, hopefully, worse than his bite. On the way up you want people to notice you. He’s now reach the pinnacle of his career. Trump has employed him as an ‘attack dog.’ Someone who will pursue his agenda, whatever that is! and follow orders, or he gets fired and Trump finds a new guy. Trump likes to be seen as someone ‘shaking things up’ in Washington. It’s difficult for him, because he was really elected as a kind of ‘one man party’ a man with huge electoral support, against both the old parties, but without a real party structure behind him or political allies ready to fill the important posts around the president. He’s really quite isolated in Washington, within the state he’s supposed to be the head of, but supported outside Washington. It’s a very odd situation. Bolton and his ilk seem angry with the world. Perhaps they sense their own mortality and want to take as many out with them as they can. Trump, on the other hand, thinks with his prick. These ‘don’t wannabe Privates [PVT’s]’ and putative regime changers, Donald ‘Bone spurs’ Trump [he couldn’t remember which foot was effected] and John ‘I don’t want to die in Vietnam’ Bolton, now lead the US war machine, both cowards avoided the US draft. I am sure both cowards are more than willing to send other peoples children to die for US goals all over the world. Bolton should register as an agent for a foreign country. Not so sure that calling people who didn’t want to fight in Vietnam ‘cowards’ is appropriate. I happen to be one of those who ‘dodged the draft’. 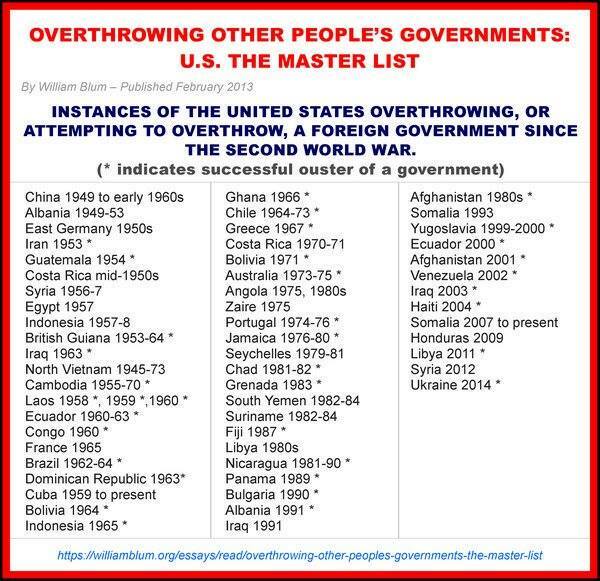 I was the right age and would have been eligible once I finished college but I just didn’t believe that America had the right or permission to invade other countries on the pretext of determining their governing system. As far as I was concerned at that time, it was none of our business. Now, perhaps Bolton’s rationale, and maybe Trump’s, was that they didn’t want to die over there but that is sort of sensible, actually. Why should anyone join the army to go overseas to kill people? It is not as if a country is at America’s borders and we are fighting for self-defense, like if Mexico decided to take us over. The whole mentality is so 19th century, actually, where men, mainly, go out and march together to shoot other men wearing different colored uniforms. If no one cooperated or joined up (mainly for money, nowadays), I can’t see the politicians going out risking their lives to do it, that is for sure, then perhaps the custom of waging war could become a thing of the past! Aren’t we supposed to be evolving? Surely the issue is people who actually support the war, but decline personal participation in it, preferring to leave the dying to others. People whose actions are consistent with their expressed beliefs at least cannot be accused of self-serving hypocrisy. Savorywill, my point is that there are occasions when war is necessary, to defend your country from an unlawful invasion for instance. If a person believes in Pacifism [I don’t] that’s a different question, in the case of John Bolton, he did support the war, then in 1970 changed his mind because he thought the war was lost and most importantly did not want to die [who does?] had he then campaigned against the war from 1970 onwards he could have redeemed himself. He did not. He was happy for other people to be sent to Vietnam and to die in those rice paddy fields. Being a coward is one thing, sending other peoples children to die when you are not prepared to serve or even to protest the war is worse than cowardice. Final word from Mahatma Gandhi who hated cowards..
Harry, I suspect that John Bolton’s understanding of what was happening in Vietnam as a young man, probably about my age then, was not so defined so as to characterize his decision not to enlist because he didn’t want to die, for whatever reason (in this case, his rationale that the war was already lost) as cowardice. Things are not so black and white, in my view. When I was a high school student, I remember telling my parents that I wanted to join the army to ‘stop communism’. They didn’t say anything but didn’t encourage me. This thinking comes from years and years of propaganda, that the Soviet Union was trying to take over the world and turn it into a 1984ish scenario (strangely, 1984 was actually required reading in my high school English class). We also had to practice diving under our desks, in elementary school, to practice if an atomic bomb was coming (as if that would have helped!). A strange environment to grow up in, for sure. I think a lot of what happens is just accidental. I applied to a number of universities and got accepted into one in California, not far from San Francisco, where university students regularly had huge demonstrations against the war in Vietnam. I even saw Robert Kennedy as a presidential candidate just before he got assassinated in LA. I didn’t deeply understand what was going on, actually, as I was going through own personal changes which were very preoccupying, but my views started changing. Anyway, it is a long story, I ended up living in India, and gradually by the time my university years were coming to an end, I had become very anti-war. But, I have to credit my circumstances as much as anything for that transformation. I think defining one’s stance on such things in terms of cowardice, or whatever, is not particularly constructive or relevant in an honest examination of people’s motives in responding to the 19th century model of having people in different colored uniforms regularly lining up on fields, commanded to shoot one another. The rolling campaign of smears directed against Corbyn are co-ordinated by the Embassy of Israel. Israel, unlike those posting here to the effect that he has surrendered or been crushed, remains of the opinion that the rise of a man, opposed to war and to the violation of basic human rights, to 10 Downing St would be a major disaster. That is why they, together with their Fifth Column in the PLP, are ferreting out every conceivable action which can be construed into an attack on Jews. The Board of Deputies not only lacks the gall to attack Corbyn in this way but knows that no more consistent opponent of racism in all its forms has ever been so close to power in the UK; in this matter they are simply lending themselves, shamefacedly, to Mark Regev who was appointed to the post for precisely this kind of work. It is not unlikely that the fingerprints on this operation will also be found on the outrage in Salisbury. Sometimes humour, even dark humour, helps to lighten fears. Trumps brought him in, along with the other sociopaths so he can frighten the children, plus i suspect he’ll allow them enough rope to hang themselves, metaphorically speaking, thus discrediting the neo con establishment and the hawkish Democrats, afterwards he’ll simply state, ” you’re fired”! I like your optimism. I you’re right. I hope the theory proves correct. Why is it that pulverising Tehran is an academic discussion, but pulverising John Bolton by putting him head first through an industrial food mincer is an act of terror? One psychopath minced to death saves one million innocent human beings. How in a sane world can that be anything but ‘securing the best possible outcome for the greatest number of people’? Of course, if Iranians do not count as human beings, then the logic would be fallacious. I am yet to read a sound legal opinion which asserts anything but Iranians are as human as any other nation on earth….. So if Bolton tries it on over Iran, have him minced to death immediately please….. Surely feet first would also suffice? I put this out on Mike Norman’s Economics the other day. American Conservative are quite enlightened and I go there a lot. We on the moderate left can unite with the moderate right to remove the liberal and conservative warmongers. The peace movement is asleep, they should march on Washington demanding Bolton’s removal. Check out Mike Norman’s Economics. Tom Hickey puts a lot of work in finding interesting articles and I occasionally put something out. Mike Norman is a hedge fund manager and is very anti neoliberal. He’s going to run for president in 2020 on a peace ticket. We follow Modern Money Theory. The American “peace movement” turned out to be just a tactic by the Democratic Party to get their personnel back into office, in which objective they were temporarily successful. Sadly, it’s one that they can no longer employ, because their main complaint against Trump, until now, has been that he’s insufficiently pro-war. It would be hard for these people to continue posing as peace activists, while going around smearing the US President as a Russian agent. There is a good article in RT today by a Jim Jatras. Nothing people on here will be unaware of but it gives a good profile of events. For every cry for peace a hundred cry out for war. Though they do it from the safety of the ivory tower. The power structure is so strong that it seams very few can permeate it and bring about a change of any substance from within. The futility is growing as Trump appears to be drowning in the sewer. Corbyn is also struggling against the tide. last week Russian apologist this week anti Semitic sympathizer. Even though more people are waking up it will take a huge paradigm shift and I have no idea how peace can triumph over war in the current climate. I think the liberals and much of the left in the West, especially in the US and UK and especially in entertainment and the media, have a massive responsibility for the rapidly deteriorating relationship to Russia. Instead of the left supporting Trump and his instinct to try ‘getting along with Russia’, thereby strengthening his hand, they did the opposite. Which is unforgivable. I think Trump was genuine about wanting better relations with Russia. He sees China as a bigger threat by far. A way to ‘control’ China would have been to ‘play the Russian card’, instead Russia and China have been pushed into each others arms and now form a formidable alliance. The neocons believe that the road to Beijing goes through Moscow, which is a major miscalculation. The US left has been ‘played.’ Russiagate, Syria, Ukraine, homo rights, the demonization of Putin, Salisbury… it’s all a campaign designed to undermine Trump, disarm any political opposition, crush the ‘revolt’ by ordinary Americans tired of endless wars, and pave the way for more conflicts and war. The media ‘left’ often call themselves ‘liberals’ or ‘progressives’ – centre-right by any metric other than their own. Their obsession with identity politics and equality of outcome lead them to despise and loathe any ideas/cultures other than their own, both native or foreign. They are supremely right. And supremely dangerous, Nihilist by word, deed and act. They will be the enablers of any future catastrophe. Birds of a feather flock together ? Bolton is not alone in his madness !